Sterke hengelhouder voor horizontale montage aan/in de boot. Houder kan 360 graden draaien plus voor-achterover in hellingshoek. Geschikt voor zoet- en zoutwater vissen. Bevestiging aluminium gepoedercoat C-Kogel. 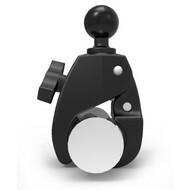 The RAP-370-RB consists of the RAM-ROD™ Light-Speed™ fishing rod holder, RAM-ROD™ Revolution ratchet arm with single open socket and 2.5" diameter round base that contains the universal AMPS hole pattern. 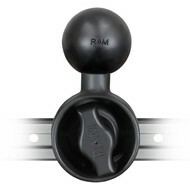 Offering the patented RAM rubber ball, socket and ratcheting feature, you can rotate the rod holder 360 degrees, while tilting the cradle forward and back for the optimum angle. 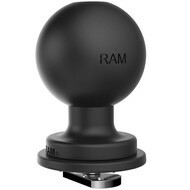 Ideally suited for spinning reels and bait casters, the RAM-ROD™ Light-Speed™ provides smooth action when inserting or removing your fishing rod, yet holds firm in rough water while trolling. The spring loaded design and stainless steel hardware will insure that this product will not only last, but will remain easy to use for years to come. 1. 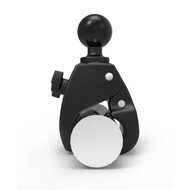 Unique patent pending design offers quick and easy removal and replacement of rod. 2. 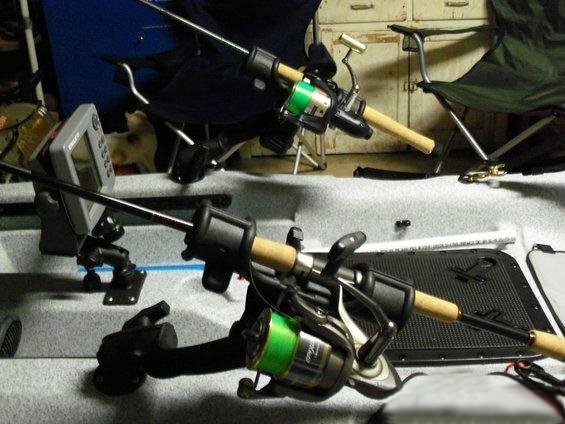 Simple and easy adjustment allows for tilting up and down as well as upright for rod storage. 3. Unique design integrates removing the rod and setting the hook seamlessly, equaling less missed fish strikes.